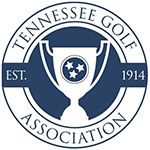 OAK RIDGE, Tenn. (Sept. 12, 2018) – After the first round of the Tennessee Senior, three players are tied for the lead at 3 under. Jeff Golliher, Steve Golliher and Mike Poe all put up rounds of 69 Wednesday at Oak Ridge Country Club. The Gollihers are brothers who both play out of Holston Hills Country Club in Knoxville. Jeff Golliher put the finishing touches on his round early on Wednesday. He made the turn at 3 under, then added a birdie and a bogey on the back. As for the other Golliher, Steve was even par when he reached the 14th tee, but had three birdies coming in to reach 69. Already this summer, Steve has played the Senior British Amateur, where he was T-41, and the U.S. Senior Amateur, where he made match play. He was one of eight Tennessee players to make the U.S. Senior Amateur. It says a lot about senior golf in Tennessee – there are plenty of competitors. Poe, a high school basketball coach, bogeyed the par-4 first but didn’t make another bogey all day. He had four birdies and a lot of pars. The leaderboard is just as crowded below the leading trio. Seven players are tied for fourth after an opening 2-under 70. Six more players are tied for 11th at 1 under. That group includes Tennessee golf legend Tim Jackson, who won this title in 2016. 54 hole stroke play championship. A cut of the low 30 Senior scores and ties will be made following the 2nd round. A cut of the low 15 Super Sr scores and ties will be made following the 2nd round. Applications are open to amateurs who possess an active USGA/GHIN Handicap Index of 10.0 or less from a TGA member club or course.